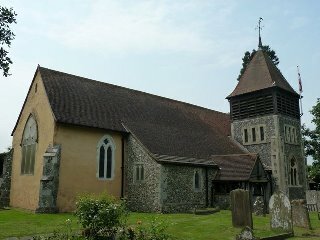 St Mary Magdalene Church is listed Grade II and is a small, essentially 13th to 14th century building, with a single north aisle to the nave. There has been a tradition that much of the early church was built c.1343, as indicated by the style of decoration of the chancel windows. During 1999, the old plaster rendering in the chancel was removed both inside and out for renewal. Inspection of the hidden construction revealed the chancel to be at least 100 years older. The internal bull-nosed roll moulding, the north window and the sedilia are 13th century. In addition, the type of flint work, hidden once again, arranged herring-bone fashion, suggests the an 11th century building. The use of these split flints gives a possible 12th century dating for further work. In the chancel, the piscina, uncovered in 1999, is carved out of a 12th century column capital which must have come from the previous building. Canterbury Cathedral has a similar capital, dated 1160AD. Originally, there was a medieval screen across the chancel opening, but it was taken down in 1886 and it was used to make the present pulpit, reading desk and clergy stall. In 1935, the son of the Rector responsible for the alteration and to atone for his father’s sins, had plans drawn up and offered to have the screen reinstated, but so little of the original woodwork could be used it was decided to abandon the idea. The Rev. Canon William Parker, B.D.Hon. Canon of Rochester, Rector of Longfield, Kent. “This Bible was part of a consignment being shipped to America in 1941. It was picked up after enemy action had sunk the ship, dried out in a bakery at Margate, Kent, by Mr A.F. Dunkley, and preserved. Up to 1066, Kent was a prosperous part of England, in part due to its close proximity to the continent and the fact that it had not suffered severely in the Danish wars. This became Langafel by 1086 and later changed to Langafeld and Langffeld. The heading on the 1558 church registers is Longfield. The following is an extract from the Domesday Book 1086 AD, in respect of Longfield. The old windows are 14th century square-headed, and the one closest to the vestry door, on the south side, contains our oldest glass fragments. Possibly a St. Christopher. The Font is a simple example from the medieval period. Being quite deep it is possible that infants were baptised by total immersion. The bell called the ‘solitary little tinkler of Longfield’, by Pevseur, is dated at 1360. Now cracked and defunct, it has a similar, younger version in use in the belfry. The church was extended westward in 1899 and is easily identified by the change in style of the roof beams and thickness of the walls. There are only three tombs within the church, one is in the centre aisle towards the chancel step and two in the north aisle. One of the tombs in the north aisle is decorated with a favourite 18th century motif. The skull and crossbones with sand-timer reminding us of the passing of our years and our own mortality. It is not, as many children who visit our church assume, the tomb of a pirate! This was held to bring to book farmers who were slow to pay their rents and tithes, as well as mischievous churchwardens and wayward clergy. Langafel Close, to the south side of the church, was the site of a very old house with extensive grounds. This was Longfield Court and it was here that former Archdeacons of Rochester sat in judgment on behalf of the bishop. The tradition that this was once the site of a former monastery is not confirmed by historical evidence. It may be that a house belonging to the church led to talk of a ‘religious house’ or a place for a community of clerics. The evidence for this having been the seat of Archdeaconal rule is much stronger. There is also a rumour of a tunnel running between the house and the church, alas this has never been proven. Anyone attending the Annual Parochial Church Meeting, or reading the Annual Accounts, may have seen an item relating to Dr Plume’s Trust. We felt that readers may be interested to know a little about Dr Plume and so are pleased to publish a few snippets of information about the gentleman in question. Died on the 20th November, 1704. He founded the ‘Plume Chair of Astronomy and Experimental Philosophy’ at Cambridge University and his contemporaries there had the little memorial window placed in the south wall of the chancel. His books are in the care of the Parish of Maldon on Sea, Essex, as his family had been influential merchants in that region. In his will, Dr. Plume made several charitable bequests, involving areas within the Diocese of Rochester, and St Mary Magdalene benefits in the form of an annual grant to maintain his grave, which is located behind the church, against the south wall of the eastern end of the nave.